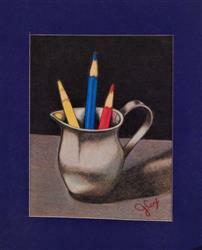 A red, blue and yellow colored pencil held in a silver pitcher provides the perfect introduction to drawing reflections and layering multiple colors to achieve depth and rich pigment. Plus this Jumpstart is the perfect introduction to using a sanded surface - Pastelbord. With the highly textured Pastelbord, you'll discover the fun of seeing light colors pop when layered right on top of dark colors to achieve shiny reflections and highlights. Don't be deceived by the simple nature of this reference photo. Ranjini will walk you through an intermediate level study of rendering metal on a unique, forgiving surface. These 28 colored pencils needed. ♦ 8 detailed steps that take you from start to finish. Printed in the USA. Publish Date: December 2017. As a newbie I jumped right into a level three and had absolutely no problem following explicit detailed instruction. FYI - when they say lightly trace image....lightly means barely touch. Over all Jumpstart level 3 was a nice place to start. 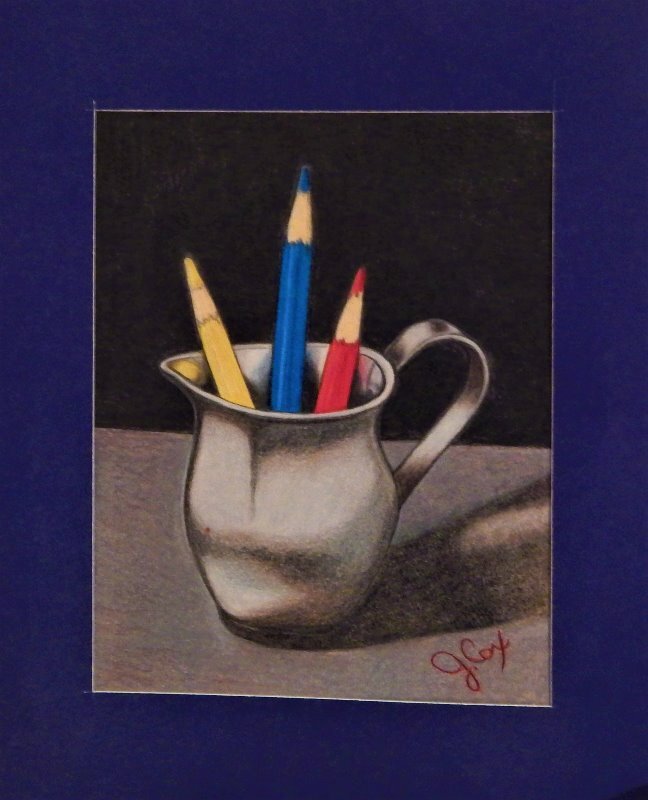 I am new to colored pencils - within the last 6 months……and have desired to move from the routine “flowers and animals” and develop expertise in glass, metal objects, crystal, etc. This project, even at a Level 3, has been very rewarding and educational. I highly recommend this project and from a beginner, don’t let Level 3 scare you away. I decided to practice first using just gray paper before moving to the pastel board. I am now ready to try the pastel board since this trial run on paper was most informative. Jump in and have fun. I have purchased all of the Jumpstart lessons and have enjoyed those that I've completed. Very pleased. This was a real challenge for me! I have been wanting to try drawing something with chrome in it and this really helped me to select the right color and technique to use! I loved working on this project!! Honestly, I haven't begun this yet but I did pull the pencils and it looks like a lot of fun.